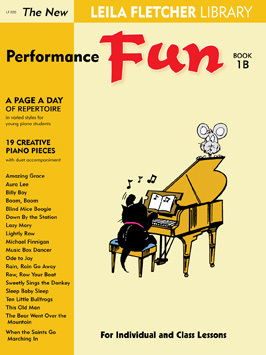 Performance Fun 1B is a collection of 19 elementary piano solos with teacher/advanced student accompaniments. 1B is a continuation of the Performance Fun series with familiar tunes ranging from pop (Music Box Dancer) to children’s songs (This Old Man), from spirituals (Amazing Grace) to jazz (Blind Mice Boogie) and Classical (Ode To Joy). A charming collection – ideal for study purposes, recreational playing, sight reading, quick studies, performance repertoire and hours of fun!